These offerings will give you freedom, fun and a fast ride without denting your wallet. When you talk about small boats, a lengthy list of benefits comes to mind. In the context of today’s fuel-conscious world, the efficiency of a single-engine boat from about 16 to 23 feet stands out as a pertinent plus for the owner. This advantage has always existed with small boats, but it’s even greater these days with the use of lighter building materials and the influx of second-generation, fuel-efficient 4-strokes, as well as direct-injected 2-strokes. We’re talking about saving hundreds of dollars each season. A 28-footer with twin 200-hp outboards can transport you around 2 miles for every gallon of gas burned at a cruising speed of 25 to 30 mph. 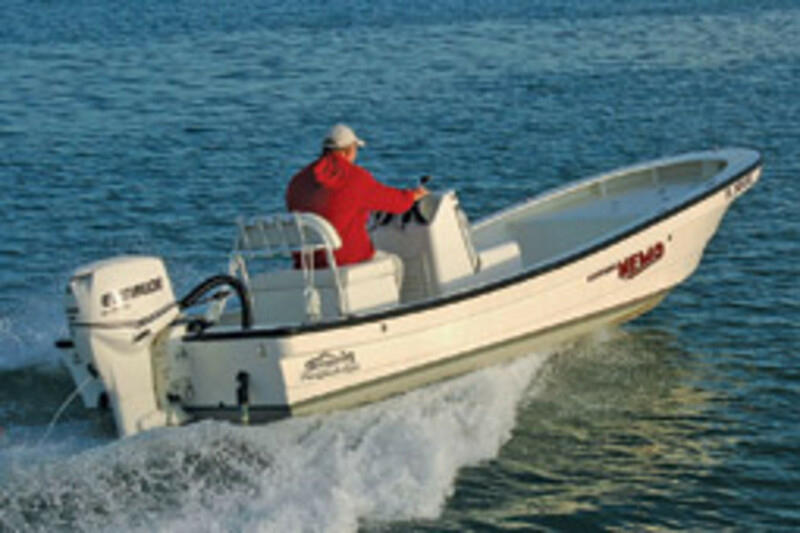 A 17-footer with a single 90-hp outboard can travel about 6 miles on a gallon at about the same speed. 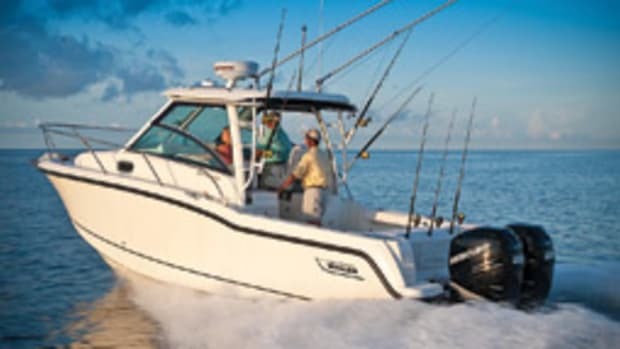 So if the majority of your boating consists of trips to and from your favorite sandbar, pulling a wakeboarder, fishing inshore or exploring inshore nooks and crannies, the small boat gets the job done while keeping your fuel budget in balance. With its low maintenance needs, the small boat gives the owner more time to get out on the water, which can be a daunting challenge in today’s busy world. “It’s all about providing fun boating in a very durable, easy-to-maintain package,” says Ron Berman, Boston Whaler’s vice president of product development and engineering. Sure, they’re no match for heavy weather, but if you pick the right day — and you have appropriate safety equipment aboard — the right small boat can safely travel 30 miles or more offshore. And with their shallower drafts, small boats also can take you into skinny water. A small boat gives the owner a sense of independence and freedom because it can be operated alone. After decades of owning big boats, some people turn to the small boat for simplicity. 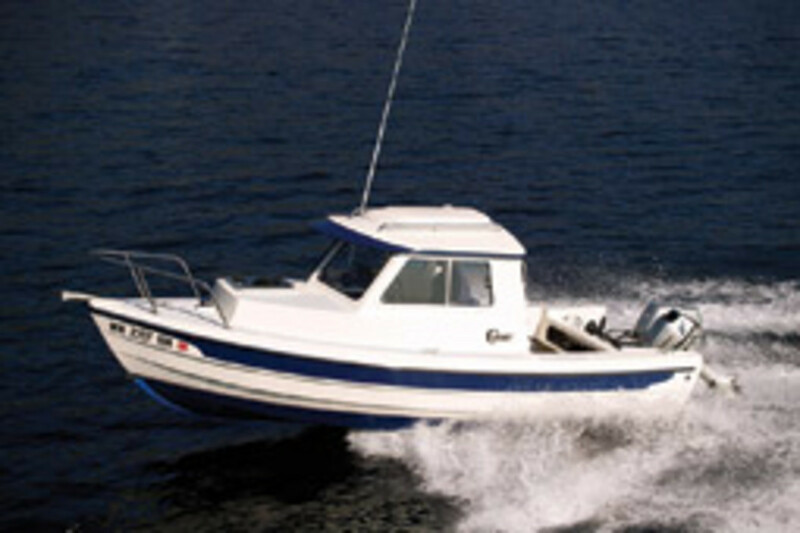 A lower purchase price, of course, remains the main attraction of the small boat. We found seven that come in below $35,000 with power. You might be surprised at what you can get for this price point. The boats featured here range from slightly less than 16 feet to slightly more than 20 feet, with beams from 6 feet, 6 inches to 8 feet, 6 inches. All are outboard-powered, and they draw 6 to 13 inches. None needs much horsepower. 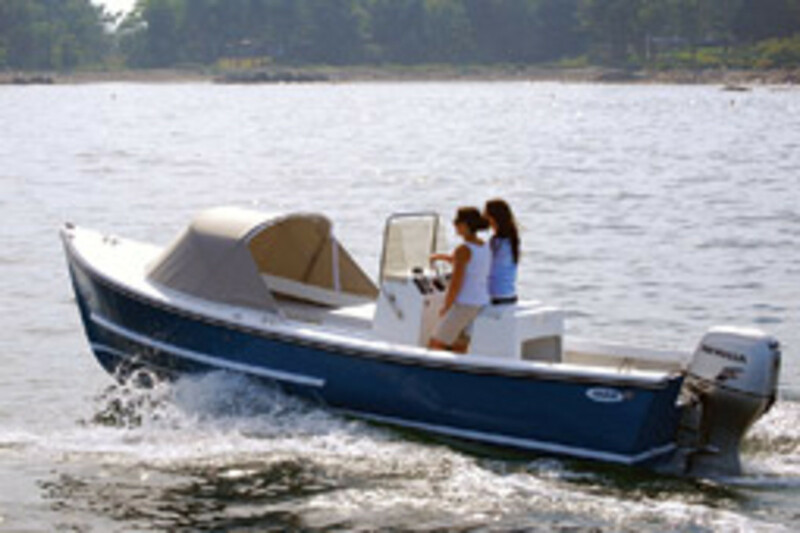 The C-Dory 16 Cruiser, for example, requires only 40 horses for a top speed of nearly 29 mph. 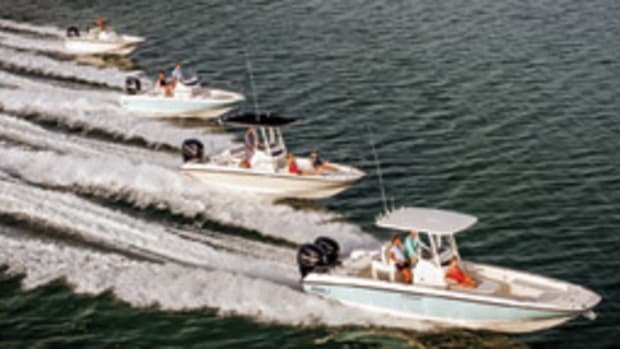 The speediest two boats — the Boston Whaler 170 Super Sport and the EdgeWater 190IS — reach 47 and 45 mph, respectively. It’s nice to have a fast boat, but these days more boaters are boasting about mileage rather than wide-open-throttle speed. 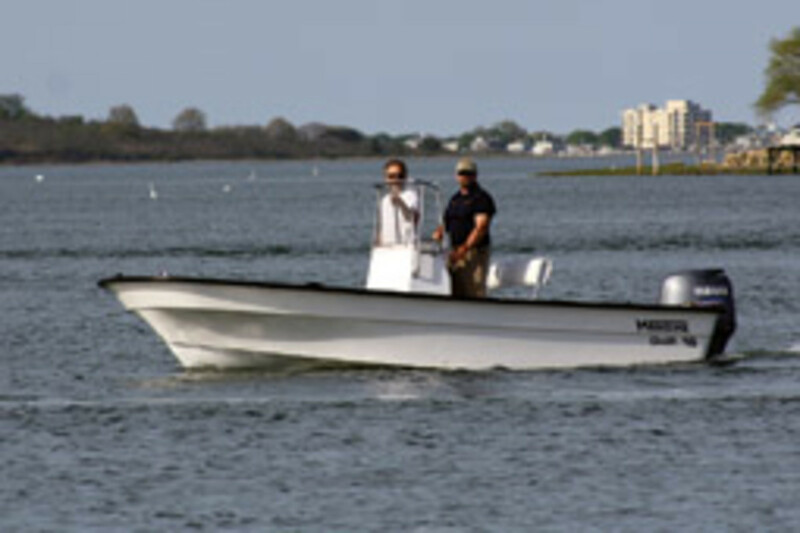 In our fleet, the C-Dory and Boston Whaler lead the way, each capable of 8 mpg when their outboards settle into their sweet spots. The boats represent builders from several areas of the country — the Northeast, the Northwest and the Southeast — and it shows in their design and styling. The Whaler and EdgeWater represent the modern, faster fleet, while the boats from Eastern and Allied shout “New England” all the way. The Super Skiff from Panga Marine has Mexican roots, and the one pilothouse model in our group, the C-Dory, hails from Washington. 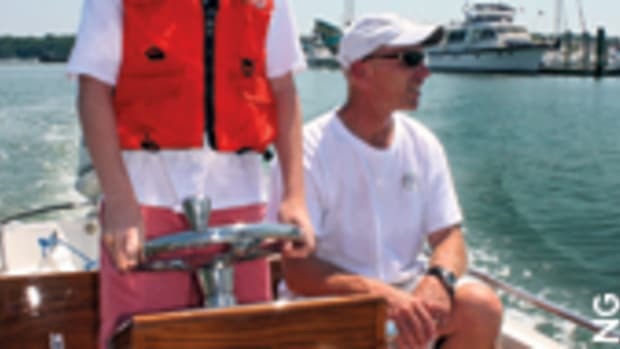 An increasing number of Lindhout’s customers are sailors or displacement-boat owners who are looking to downsize or lack the time to use their boats, Lindhout says. However, the C-Dory also makes a good first boat. “It is for someone who wants to get into boating but doesn’t want all the hassles that come with big-boat boating,” he says. The cabin area includes two swiveling seats on top of storage lockers, a V-berth and a portable head. The skipper drives from a starboard helm, and there’s a companion seat, but the cockpit is open. In addition to the head, standard equipment includes a 12-gallon portable fuel tank, exterior handrails, an electrical system with a six-circuit panel and color-coded wiring, and a V-berth cushion with a Sunbrella cover. With its cored hull, the boat weighs only 925 pounds. (Trailering weight is 1,700 pounds.) It draws 6 inches and can take up to a 55-hp outboard, though it requires only 40 horses to perform well and gets an impressive 8 mpg at 25 mph. MSRP is $24,900 with a 40-hp Suzuki. 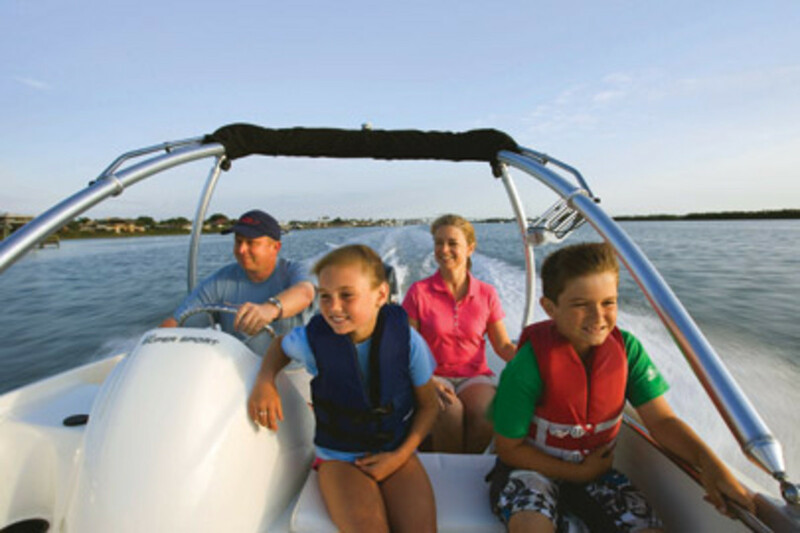 The largest boat in Boston Whaler’s Super Sport lineup, the 170 SS has the ability to morph into several boats. With an optional tow arch, you have a water-sports boat. With Whaler’s fishing options — not to mention the boat’s 9-inch draft — it does the job for inshore anglers. And it can serve as a tender or as a boat for younger family members to mess about in. 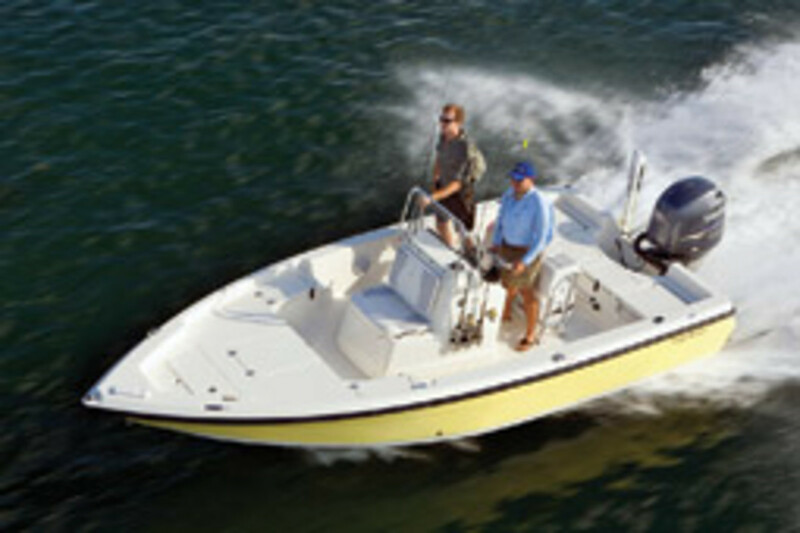 Based in Edgewater, Fla., Whaler builds premium boats, but this model was built with price in mind. “Compared to a 17-foot Montauk, it gives a customer a way to get into a 17-foot Whaler for much less money,” Berman says. 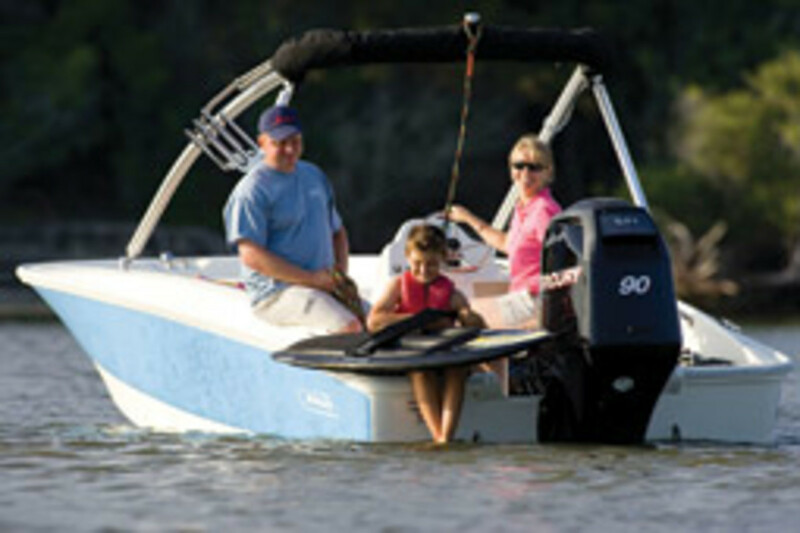 Base prices with a 60- or 90-hp Mercury 4-stroke and trailer are $21,442 and $23,366, respectively. A 170 Montauk with a 90-hp engine and trailer is about $30,000. The 60-hp engine will push the 170 Super Sport to a top speed of 33 mph, topping out at 47 mph with the 90-hp outboard. The 90 delivers excellent fuel economy, more than 8 mpg from 20 to 30 mph. With the 60-hp engine, the boat gets 3.5 to 4.2 mpg at 20 to 27 mph. “The 60 has to work much harder to achieve those speeds, which accounts for the efficiency differences,” Berman says. 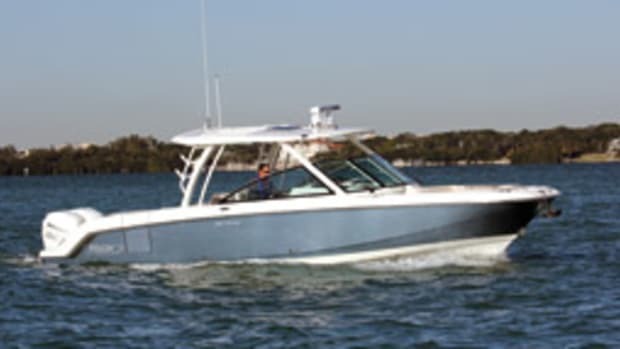 Maritime Marine builds the boat with a bow casting platform that houses storage, a leaning post and a console with a windshield and an integrated forward seat. Customers like to outfit the boat to meet their needs, so the builder offers several versions of a leaning post, a T-top, an aft casting platform, rod holders and a bow coaming kit that dresses up this rolled-gunwale boat, among other options. Maritime skiffs always have been built for maximum efficiency. Construction materials and methods help keep the boat light, Galvin says. Maritime Marine uses resin infusion (resin vinylester) to build all of its boats. The hull bottom and sides are solid glass, with a cored deck and transom. The Augusta, Maine, builder hangs outboards from Evinrude, Honda, Suzuki and Yamaha. With a 75-hp Evinrude E-TEC fuel-injected 2-stroke, the relatively flat bottom (10 degrees at the transom) and lifting strakes help the boat plane in about 4 seconds and stay there at only 12 mph, Galvin says. “There’s absolutely minimal, if any, bow rise, and it rides horizontal at any speed,” Galvin says. At 20 mph, you’ll be getting 6.1 mpg with a range of 143 miles using 90 percent of the 26-gallon fuel tank. Like the Maritime, the Allied RB-19 is a rolled-gunwale boat. Allied Boat Works hand-lays the RB-19 using such materials as polyester resin, mat and woven roving, says David Cunniffe, one of Allied’s four partners. The Peru, Maine, company uses Nida-Core (a honeycomb composite material) in the deck and StarBoard (a high-density composite material) in the transom as core materials. 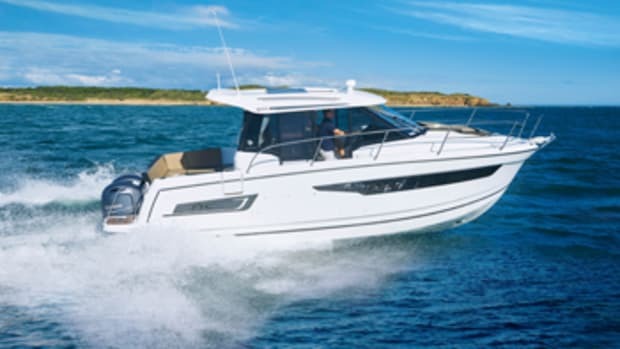 Allied, which was founded in 2009, builds bare-bones recreational and commercial boats, and has dealers in Maine, Connecticut and Massachusetts. With its tall bow and sharp forefoot, the RB-19 should have no problems dicing up a chop. And talk about a swooping sheer line. The builder trims the boat with Trex, a wood alternative made of recycled and reclaimed plastic and waste wood that looks good and stands up to the marine environment, Cunniffe says. Trex can be used for spray rails, gunwale rails, leaning post handrails and other deck accoutrements. With a standard 60-hp outboard (Suzuki or Evinrude), the boat tops out at 30 mph and cruises at 15 to 18 mph, says Cunniffe. It measures 19 feet, 8 inches and has a beam of 8 feet, 6 inches. It draws just 8 inches. EdgeWater acquired the tooling for the 190IS and three other boats from now-defunct Century Boats, which was owned and operated by Yamaha, EdgeWater president Peter Truslow says. “When the Century tooling became available, we knew these boats were quality designs, and the engineering is fantastic,” he says. “They are proven designs and we’ve put the EdgeWater touch on them.” Part of that touch is the company’s Single Piece Infusion construction, a resin-infusion building method. 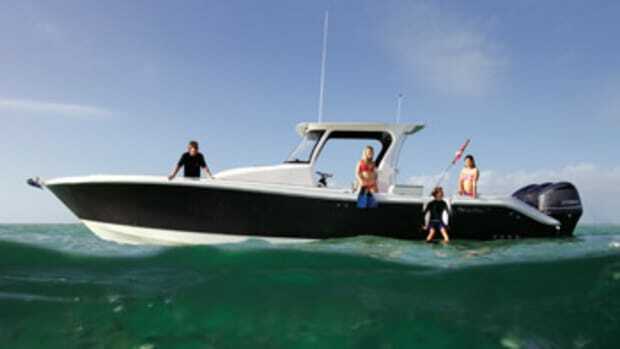 With a Yamaha F150 4-stroke, the 190IS (InShore) gets nearly 5 mpg at 23 mph and 4 mpg at 32.5 mph. The outboard pushes the boat to a top speed of 45 mph. Only the Whaler beats that with a 47 mph wide-open throttle. The boat has an LOA of 19 feet, 6 inches, and its 13-inch draft can get you into some skinny water. An optional hydraulic jackplate or jackplate ladder will further aid shallow-water navigation. Bow and stern casting platforms house the anchor locker, three storage lockers, a two-lid live well and a fishbox, all standard. The leaning post comes with a cooler under it, and the boat has recessed gunwale rails and handrails on the console and leaning post. There’s a second standard live well in the console seating. Handrails flank the two-person seating pad. Stern seats, hydraulic steering, pedestal seats for the casting platforms and a split bow rail highlight the options list. 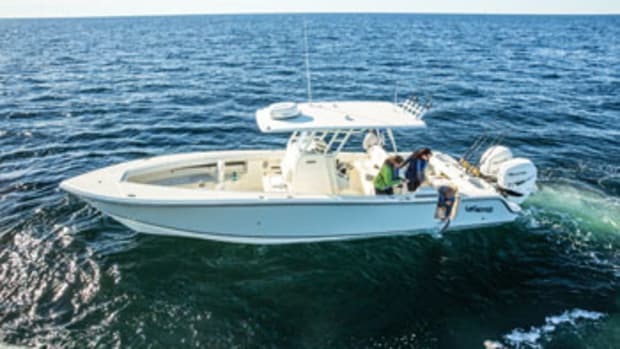 The Panga Marine 20 Super Skiff, from a basic setup to a fully rigged version, is a seaworthy, unsinkable fishing boat that will run in 8 inches of water and draws only 6 inches with the engine raised, company owner Rob McDaniel says. 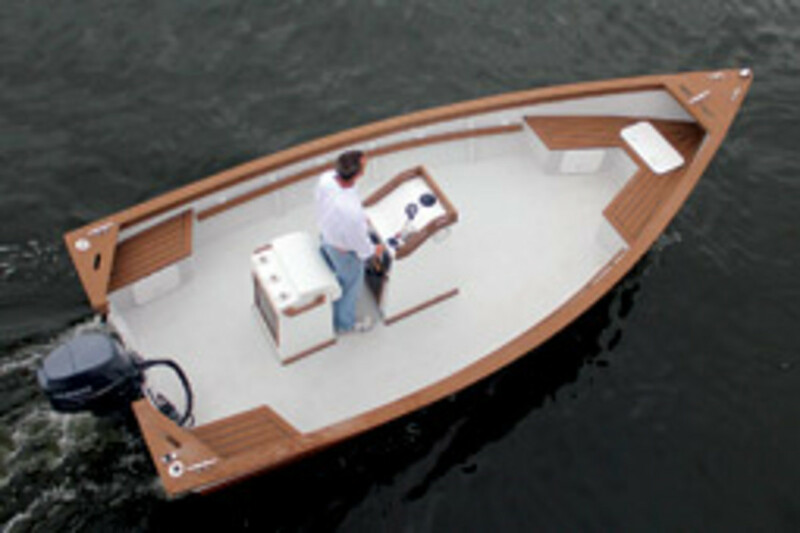 Despite its 20-foot, 1-inch length, the boat has only a 6-foot, 6-inch beam. The long, skinny design makes for an efficient hull that gets 7.5 mpg with a 90-hp Evinrude E-TEC at about 30 mph. The Super Skiff tops out at about 40 mph. Maximum horsepower is 130 and it has a 29-gallon fuel tank. A console with no-feedback steering and a stainless-steel wheel is standard, along with a cooler bench seat with four rocket-launcher rod holders. 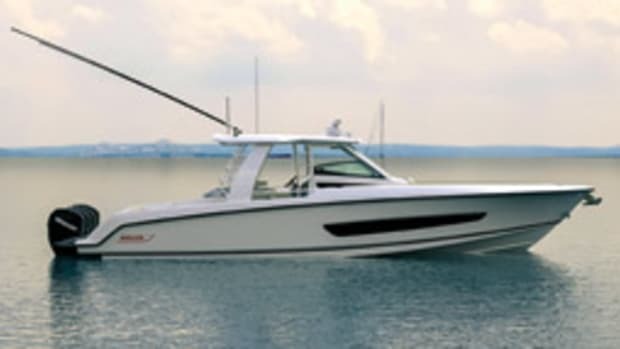 There are 22 items on the options list, including seat cushions, a Bimini top, soft or hard T-top, a poling platform, trim tabs, hydraulic steering and an electric jackplate. The Eastern 20’s hull shape is similar to the Allied RB-19’s, with a tall bow and a narrow forefoot. The boat was built in the 1970s as a 19-foot Seaway, says company president Bourdeau, and Eastern acquired the mold in 1989. The Milton, N.H., builder stretched the hull by about a foot about seven years ago to meet Coast Guard requirements, he says. With a 7-foot, 6-inch beam, the 20 is a beamier alternative to the Eastern 18. “You can have a family of six or so on board and still not feel cramped,” says Bourdeau, who began working for Eastern in 1989 and bought the company in 1993. Toekick around the console and leaning post gives you extra room and “cleans up the installation” of these components, Bourdeau says. rating and a range of 252 miles. It hits about 35 mph wide open. This article originally appeared in the November 2001 issue.